Five years ago when I was accepted as a Professional Member of the Cat Writers' Association I wrote that it was a dream come true. I still have a file folder in my desk filled with articles I printed out from the CWA website dated 2006. Back then I studied the membership requirements and made a vow to myself that one day I would become a member of this exclusive group of cat writers. It took me another 5 years to start blogging, and even more time after that before I realized my true blogging passion was cats. What else could it possibly be? Even after being honored with a membership, the idea of ever winning a coveted Muse Medallion was so far in the back of my mind it was practically non-existent. I still had much work to do on honing my craft. Still, you'll never know if you can achieve something unless you try, so with the knowledge that Truffles' tragic passing inspired some of the best writing I'd ever done, in 2016 I decided to dip my toe into the water and enter their annual writing competition. Entries in each category are reviewed and judged independently by three professional CWA members and their scores are averaged by the Contest Chair to determine the winner. Anyone earning an average of 90 or higher based on the scores submitted by the three judges receives a Certificate of Excellence, with the highest score winning the Muse Medallion. I entered the Blog/Any Other Topic category, and not only won a Certificate of Excellence, but also the Muse Medallion...on my very first try!!! 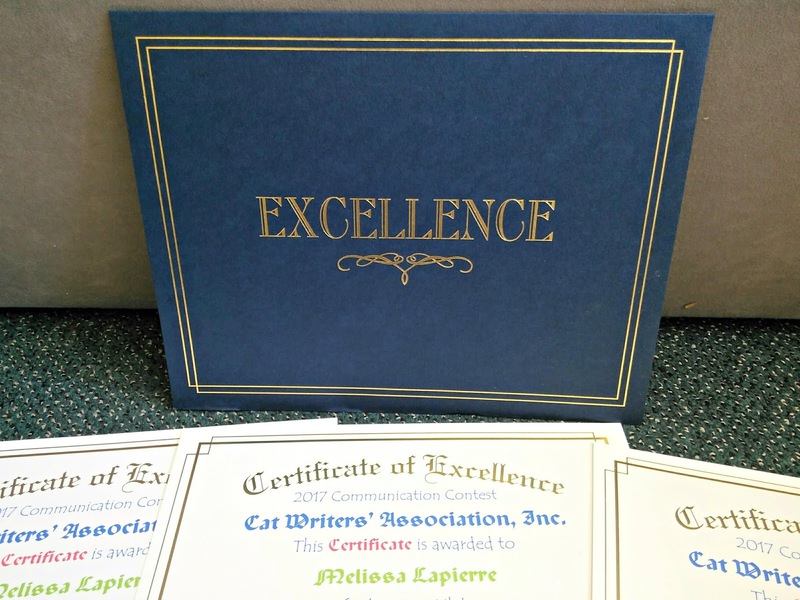 Last year I decided to veer away from the blog category and instead selected individual articles to submit in a variety of categories, just to see if I could measure up to so many other amazing cat writers. You can only imagine my shock when I won FIVE Certificates of Excellence!!! This year I took the same approach and submitted four articles (one from this blog and 3 from my freelance writing for the Canidae blog). 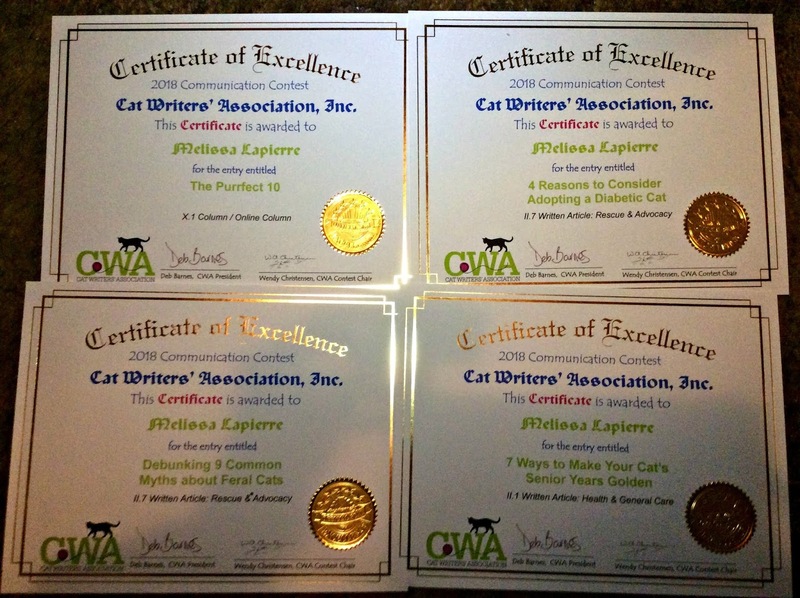 I'm so excited to say that all FOUR won a Certificate! Muse Medallions will be given out at the Cat Writers Conference in St Louis in May. I'm certainly not planning to win any because the competition is stiff, but just being a contender is an incredible honor! Big congratulations to you! Paws crossed for some Muses! The only bummer thing is I will miss seeing you at the banquet - I wish you would come! My human and I would love to meet you in person! Congratulations, Melissa! So well deserved! Big congrats from all of us, that's fabulous!!! That is wonderful! Congratulations. Mom just became a member of the DWAA and is trying to figure out what it is all about. This is a good inspiration. Dang, there I go again, got so excited for you I forgot to say thanks for joining the Thankful Thursday Blog Hop! Concatulations to you and your mommy! These certificates are so well deserved! Congratulations! Those are beautifully written articles, the awards were well deserved. I can't thank you enough for writing 'Debunking 9 Common Myths about Feral Cats'. It was so well done, I got all teary-eyed reading it. It also gave me some important points to use when talking with folks about ferals and stray/abandoned cats. Thanks Melissa and Mudpie! [jumping up an down & paw clapping] Oh that is just wonderful news! Mom and I are so-o very thrilled for you! You should be very proud! CONCATS for making your dreams come true! Mom has been thinking about joining CWA. She's met more than a pawful of some of its members in purr-son. Winks. Totally epic wins. Well done and I know you will both be very proud! YAY!!! Congratulations, Melissa! I am so happy for you! Brilliant and well-earned! Your blog continues to be one of my favorites, and I love reading your articles! I couldn't be happier for you Melissa, HUGE CONGRATULATIONS and BEYOND well deserved!!!!!! I love your story of how this was a goal for many, many years....you write beautifully, you cherish the written word (that is obvious)........well done YOU!! Extremely well deserved! We're sending you all of our congratulations and concatulations! You more than deserve every single one of these. Tons of congratulations to you, Melissa on all of these. We just finished reading the senior/golden years article, and mom and dad already adhere to most if it for me. Dad also has old posts of the stairs he built for his old pal Orbit, plus they have a 2-step footstool next to their bed for me. Dad (mostly) has playtime with me throughout the day, and it's a regular part of our daily bedtime routine, too. We're so happy for you, Melissa! And proud of you for getting this well-deserved recognition! Congratulations!